What if we tell you that it is possible to turn your e-commerce storefront into an online auction? And this procedure does not require much time and effort! Sounds really intriguing, especially if you understand how a simple auction can engage customers to purchase more (or spend more money if you sell something really exclusive). 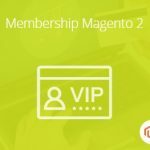 So, you only need the Magento 2 Auction extension by Magestore, and below we review it in the smallest details. 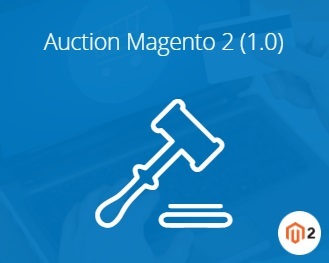 You can still find the description of the Magento 2 auction extension by Magestore below. 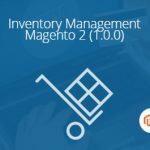 After the Auction Magento 2 module is installed, you can easily configure its settings (the process is described in the Backend section of this Magento extension tutorial) creating unique rules that will help you prevent both under- and over-selling. But what about customers? Why should they participate in online auctions? The answer is quite simple: you let them save. For instance, the ordinary price of an item you are going to put on the auction is $100. You set a start price which is $50 and a bid increment of $2. The probability to purchase the item for a price that is lower than $100 is very high. That’s how you motivate store visitors to take part in the competition with others consequently increasing your sales. But what if most store visitors are too lazy to place bids manually? on a single page, so customers can easily find them. Informative Design. 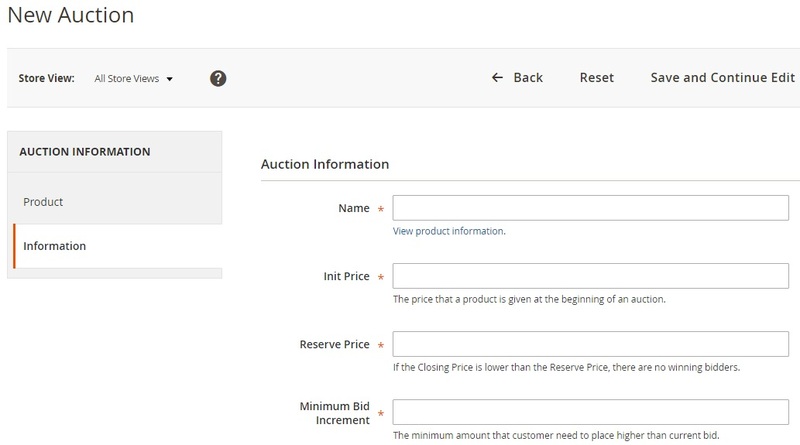 Both product and auction pages provides enough information for customers to be engaged: timers, initial bids, bid increment, ordinary price, etc. Auction Page. The Magestore Auction Magento extension adds a special page with all current auctions, so it is easy to discover them. Auto-bidding. In addition to manual bidding, your customers can fully leverage fully configurable auto-bidding. Extended Auction Time. Another important feature is related to a timer. If a bid was placed during the last seconds, the timer will be reset to reproduce a real auction. Reserve Price. 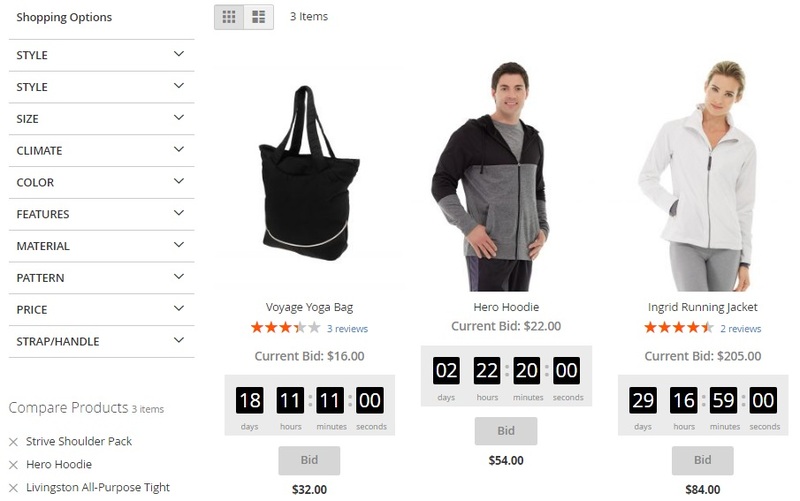 To prevent your store from under-selling, Magestore Magento 2 Auction offers such feature as Reserve Price. If an auction was closed with a price which is lower than a reserve price, no one becomes a winner, but all participants get notifications. Watch List. A customer can add any auction to his or her watch list. Besides, they can be notified via email on each auction status. Email notifications can be sent to your admins as well. Let’s configure the extension first. Go to Stores -> Settings -> Configuration -> Magestore -> Auction. 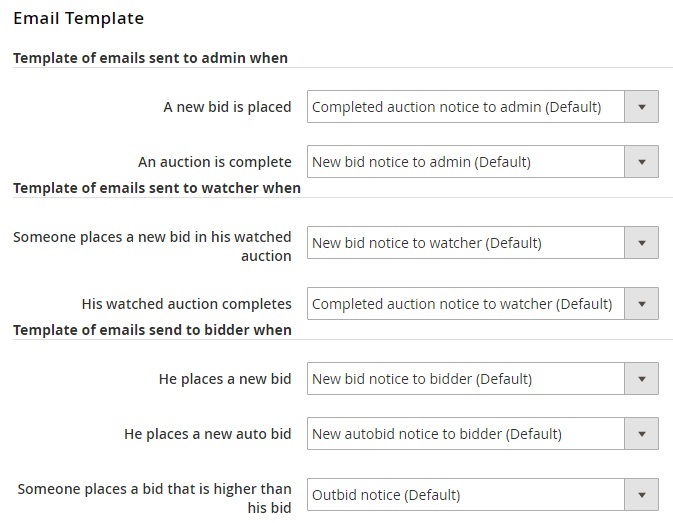 There are 5 groups of settings here: General, Auto Bid, Bidder Name, Email Template, and Implement Code. 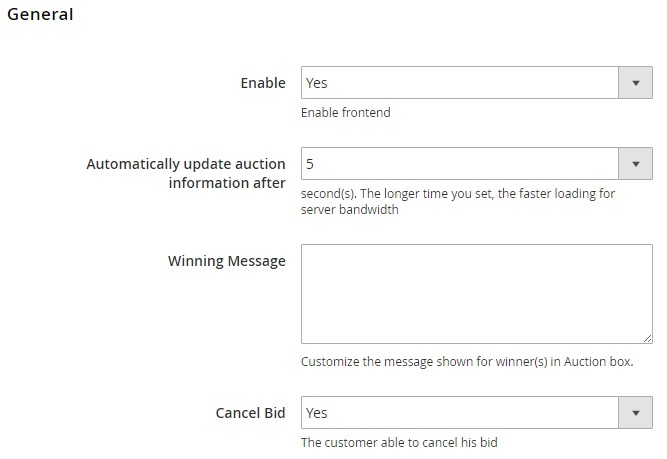 The General section allows you to enable/disable the auction functionality for your Magento 2 website, choose time intervals for updating auction information, set a warning message that is shown for winners, as well as provide customers with the ability to cancel bids. The Auto Bid section only allows you to enable/disable the corresponding feature. If it is enabled, all bids are placed automatically. The minimum increment bid is used. In the Bidder Name section, choose what bidder’s name should be used. It can be generated by the extension, created by a customer, or be based on customer’s name. In Email Templates, choose template for specified occasions. The section is divided into three parts: the first one is related to admin, the second one – to watcher, and the third one – to bidder. 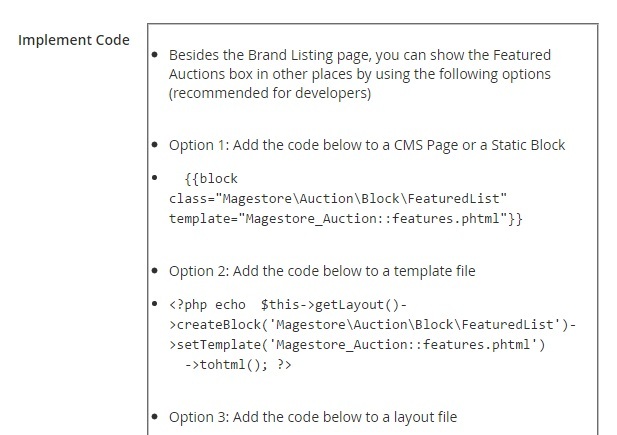 The Implement Code section provides 3 code snippets that can be used for adding the Featured Auctions box to any place on your Magento 2 website. Now, we’d like to shed light on auction management. Go to Product -> Auction -> Manage Auctions. Here, you can see a grid with all auctions: Finished, Processing, Not Start, Closed, Closed Without Winner, Disabled. Mass actions allow you to delete or change statuses in bulk. 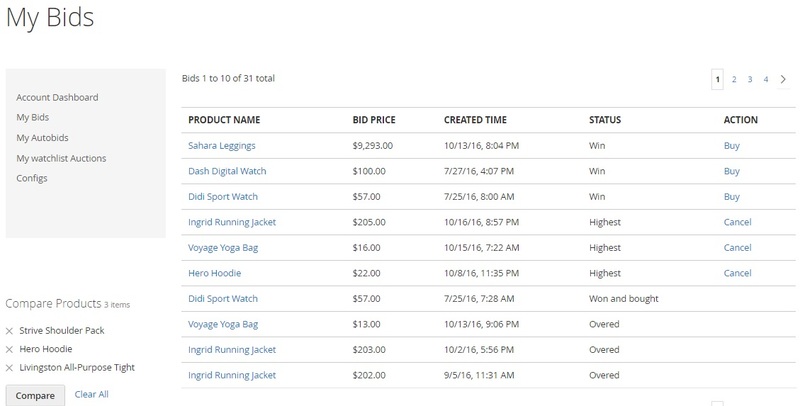 Besides, you can edit each auction, export a CSV or XML file, as well as add a new auction. Starting and Ending Time (period while the auction will be available), Extended Time (time that will be added if a bid was placed within the last seconds of the auction), Multiple Winner (the number of winners). As for the “Sell auctioned product normally” setting, it allows customers to avoid auctions and purchase at actual prices. In “Sell normally after”, you specify a time interval after the auction completion while a winner can buy an item for the final price her or she set in the auction. After this period, the product is sold normally. As for other settings, you enable/disable “Featured” and choose the status of the auction. Now, go to Product -> Auction -> Manage Transactions. All transactions are gathers in a grid. You can Export them as a CSV or XML file as well as add new ones manually. 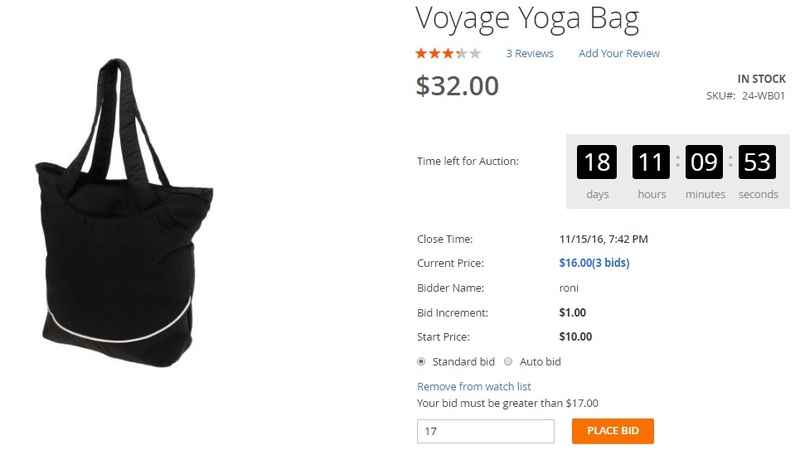 Each product offers such information as name, rating, number of reviews, current bid, time left to the end of the auction, the “Bid” button, and normal price. Additional information is: Close Time, Current Price, Bidder Name, Bid Increment, and Start Price. A customer can choose between standard and automated bidding. Besides, he or she can add the auction to a watch list. Next, there is a field for placing bids. 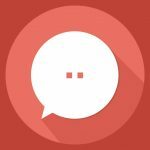 The Magestore Magento 2 Auction extension shows a minimum bid amount. My watchlist Auctions contain all auctions a customer is monitoring. 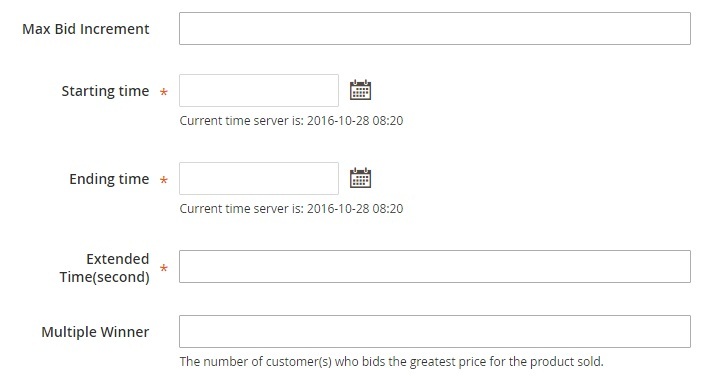 Product name, number of bids, start price, current price, start and end time, and status are shown in the grid. Besides, it is possible to remove each item. In Configs, a customer can enter his or her bidder’s name and set up email notifications. As you can see, eBay-like auction can be easily implemented on your Magento website, there are both Magento 1.X and Magento 2.X modules, so your platform version does not matter. As for the usability of Magestore Auction, it offers an admin-friendly backend that is full of necessary features and options. In their turn customer also get an intuitive interface and user-oriented features, such as auto-bidding and auction watchlist. The price of the Magestore Auction Magento 2 extension is $299, while its predecessor costs $149.